What is Giyaarween Shareef ? 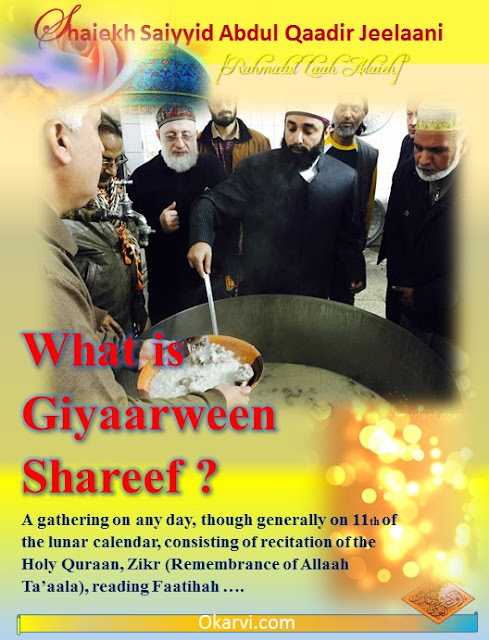 the Holy Quraan, Zikr (Remembrance of Allaah Ta’aala), reading Faatihah and distributing food to send the reward to Huzoor Ghaus e A’zam Saiyyidinah Shaiekh Saiyyid Abdul Qaadir Jeelaani (May Allaah be well pleased with him) is called Giyaarween Shareef. Its basis in the religion is from the concept of sending reward to others. This is commonly known as Ieesaal-e-Sawaab, and it has been proven from the Quraan and Sunnah. 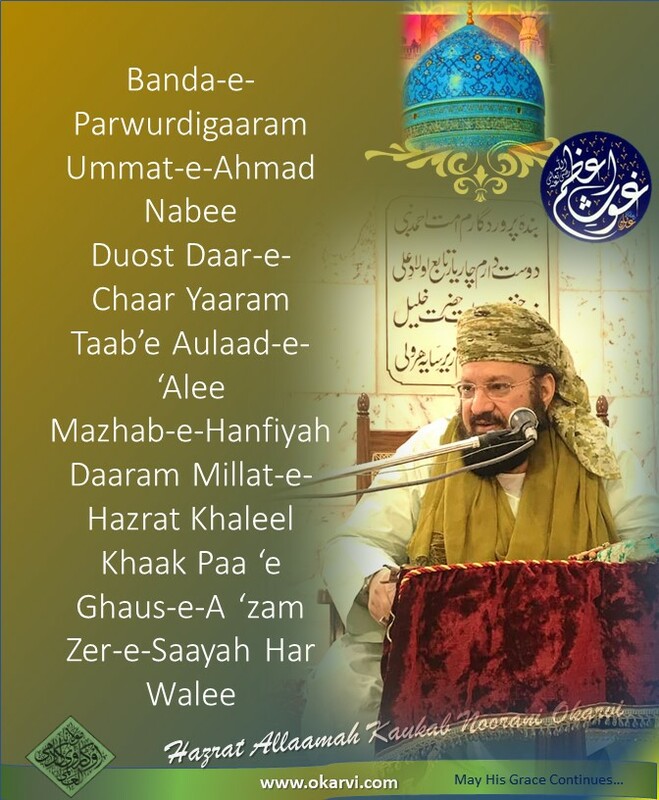 Ieesaal-e-Sawaab is act of performing a virtuous deed and sending the spiritual reward to another. This proves that the prayer of Muslims for the forgiveness of other Muslims is from Quraanic teachings and Ieesaal-e-Sawaab is actually a form of supplication (Dua). 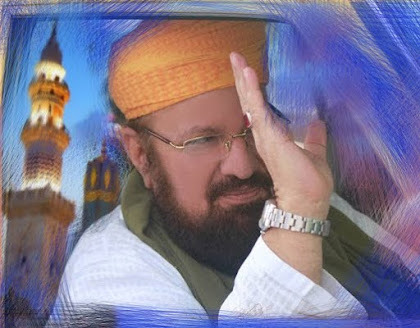 Hazrat Ghaus al-A’zam [Rahmatul Laah Alaieh] blessed mother asked him to undertake the journey to Baghdad but he should not lie under any circumstances. She sewed forty gold dinars in the seam of his coat and set him on his way. On the way highway robbers laid siege to the traveling party. 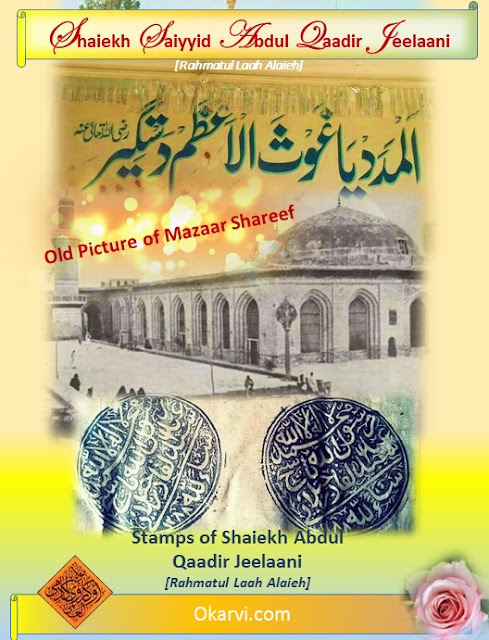 O ‘Abdul al-Qaadir if you told me you have nothing on you I would never have suspected you are carrying wealth and it would have helped you in a strange land. Hazrat Ghaus al-A’zam [Rahmatul Laah Alaieh] replied, ‘I could have hidden it from you, but in the process I would have to lie. I left home and promised my mother I would never lie. I could give my life but I cannot break my promise to my mother.’ These words of truth uttered by the truthful one had an effect on the heart of the robber. The words of the Friends Of Allaah Kareem have great effect on the listener. The robber began crying and said, ‘This young man fears displeasing his mother whereas I have transgressed the Laws of Allaah[Ta’aalaa] and thereby earned the displeasure of the Holy Prophet Muhammad [Sallal Laahu Alaieh Wa Sallam]’. The robber repented and sought forgiveness for his sins. 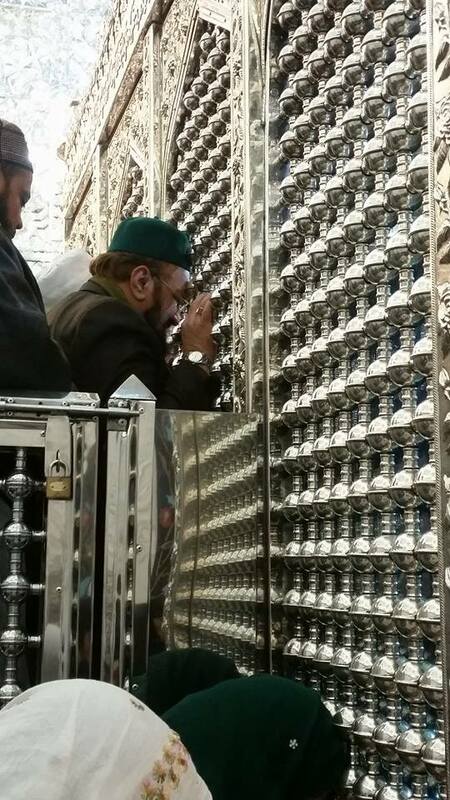 He asked Hazrat Ghaus al-A’zam [Rahmatul Laah Alaieh] to raise his hands and make Dua for him with that blessed tongue that has so much of effect in it. 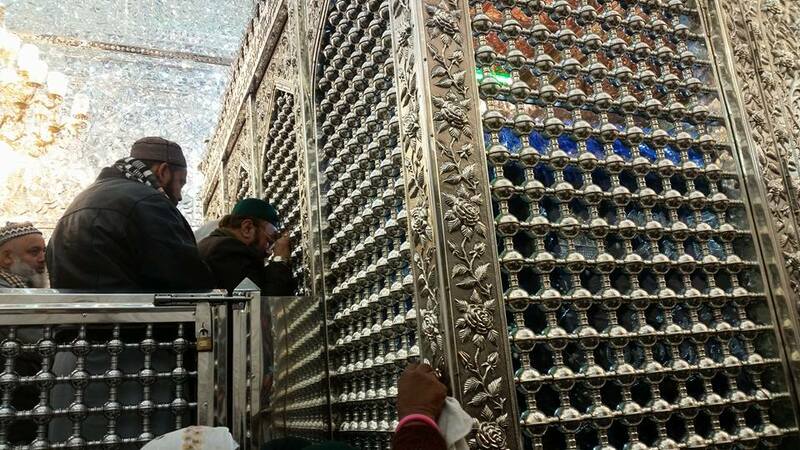 Hazrat Ghaus al-A’zam [Rahmatul Laah Alaieh] replied, ‘I will pray for you on condition that you return all the goods you plundered from our caravan to their owners’. The robber returned everything, including the forty dinars. 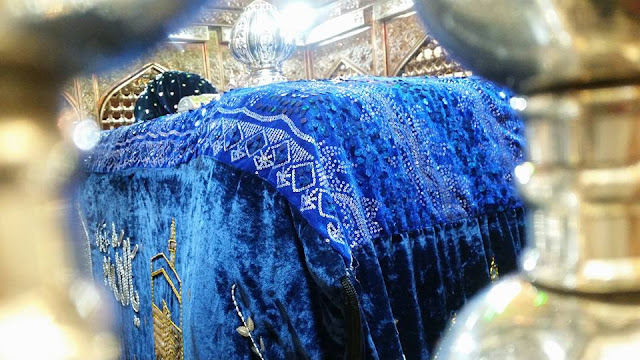 When Hazrat Ghaus al-A’zam [Rahmatul Laah Alaieh] began his supplication [dua] the other robbers requested that they also be included in the supplication. In the course of the dua the fate of the robbers changed to the extent that Allaah Kareem granted them Wilaayat. 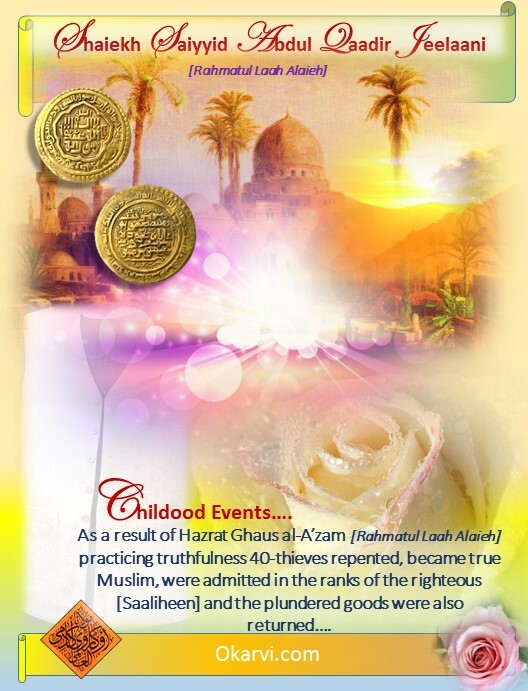 As a result of Hazrat Ghaus al-A’zam [Rahmatul Laah Alaieh] practicing truthfulness 40-70 thieves repented, became true Muslim, were admitted in the ranks of the righteous [Saliheen] and the plundered goods were also returned....Sub Haan Allaah!! !